Mavis Hawa Koomson, Minister of Special Development Initiatives, has assured Ghanaians that the country will soon see massive projects across the 10 regions. She made these known to DAILY GUIDE after embarking on a 10-day tour of the Middle Belt as part of the implementation of the $1 million per constituency programme promised by President Akufo-Addo. Ms. Koomson disclosed that hundreds of projects under the government’s Infrastructure for Poverty Eradication Programme (IPEP) under the One-Constituency, $One million policy have already been started in all the 275 constituencies across the country. The Minister on August 6, 2018 began her tour from the Brong Ahafo Region through the Ashanti Region and ended in the Eastern Region. The 10-day tour was to access at first-hand, the progress of some special development initiatives started by the Ministry under the Middle Belt Development Authority. The Ministry has already begun the construction of 1,000 limited community mechanised water systems with solar pumps and 1,000 10-seater community institutional water closet bio-digester toilets with mechanised boreholes in all the 275 constituencies. These projects are in addition to the 570 small dams and dug-outs that have also started in the three northern regions under the One Village, One Dam initiative under the supervision of the Northern Development Authority. These ongoing projects are in line with President Akufo-Addo’s aggressive pursuance of policies that are targeted at upgrading and improving infrastructure, and or on developing new facilities, especially in rural and deprived communities aimed at improving the lives of the populace. 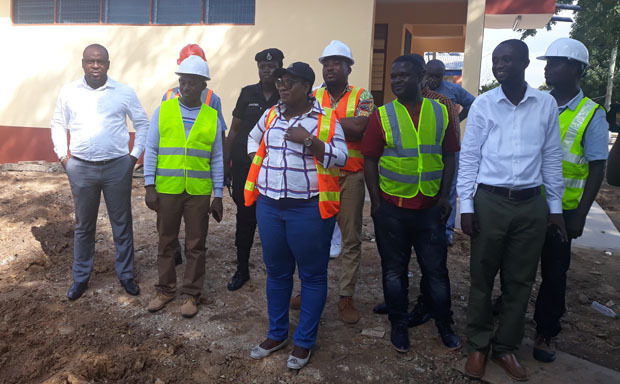 The Minister, after inspecting some of the projects in Koforidua, Suhum and Nsawam, told DAILY GUIDE that she was very impressed with the ongoing projects. “These interventions form government’s specific strategy to meet the Sustainable Development Goal 6 (SDG 6), which targets providing clean water and sanitation for all irrespective of location,” Ms. Koomson said. In the Brong Ahafo Region, she visited Berekum West District, Jaman North District, Dormaa East where she inspected a number of ongoing projects ranging from compact toilet facilities, boreholes, among others. According to her, government, through the Ministry of Special Development Initiatives, is also providing similar facilities in all the 29 constituencies in the Brong Ahafo Region. In addition, the region is also benefiting from the construction of six 1,000 metric tonnes pre-fabricated grains warehouses in Wenchi, Atebubu, Busunya, Techiman and Sunyani as part of One District One Warehouse (1D1W) initiative. In the Ashanti Region, the Minister inspected the ongoing construction of water closet bio-digester toilets in communities such as Biemso and Adugyama in the Ahafo Ano South-East District, Mankraso in the Ahafo Ano South-West District, Dwamena-Akenten SHS and St. Jerome SHS at Offinso South District, Heman D/A and Afrancho Krobo in the Kwabre East and Afigya-Kwabre South District and Meduma in the Afigya-Kwabre East District. All the 47 constituencies in the Ashanti Region are receiving three water systems and three toilet facilities each. She took the opportunity to pay courtesy calls on the traditional and Muslim leaders to explain the initiatives to them. She was accompanied by Members of Parliament (MPs) and the MMDCEs in the constituencies she visited.